Neil Monnery takes us through his favourite Martin Tyler commentaries, to celebrate how the iconic voice of the Premier League is linked to memories for so many football fans. 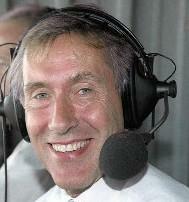 Martin Tyler is well past retirement age but is still going strong and is the voice of the Premier League. I spent an afternoon on YouTube going through some of his best moments and they brought back so many memories. I decided to collate them here and I hope (and suspect) they'll bring back some memories for many others as well. Chelsea had been battered in the 2012 Champions League Final but had held their own until the 83rd minute. When Bayern took the lead most people thought that was that, however Didier Drogba had been quite the talisman for this side and he wasn't done. Martin Tyler was ready for his dramatic equaliser. John Arne Riise was a left-back with a knack of smashing in the old cracking free-kick. Back in the late 90s and early 2000s, both he and Ian Harte would be fantasy stalwarts for many. In the real world though Riise's finest individual moment may well have been his rocket against Manchester United at Anfield in 2001. Liverpool won the Champions League in 2005. It was one of the most memorable nights any British football fan has witnessed. However none of that would have happened had Liverpool not scored three times in the second half of their last group game, the final goal saw Andy Gray jump in over Martin Tyler, but the initial call is still one of his best. 'Kanu believe it?' What a pun. Kanu was a relatively unknown player when he came to Arsenal, but one soggy afternoon with his side 2-0 down at Stamford Bridge, the Nigerian announced himself to the world. His hat-trick goal provoked one of Tyler's great calls. England needed to draw with Greece to quality for the 2002 World Cup. They were playing at home. It was a no brainer. A funny thing happened on the way to this fait accompli, England stunk and needed a last inute hero to take them to the far east, David Beckham was that man. One of my personal Martin Tyler favourites. Manchester City, who were gunning for the title, travelled to the Stadium of Light and tore the home side apart, yet they couldn't score. Deep in added time Sunderland managed a rare foray into the City penalty area and, unbelievably nabbed the winner. Martin Tyler's voice was ready to crack. Three of the top five most memorable Martin Tyler goal calls are for Manchester United. This figures. United were involved in so many of the biggest games in the last 20 years and you know they scored late goals, we all know that. This one wasn't as late as the other two but he nails that inflection. One of the greatest games in FA Cup history. This game had it all. It was won by a great goal and even though Tyler's initial goal call wasn't that dramatic, he really follows it up superbly. His voice really cracks on this one. A winner deep in added time isn't exactly abnormal for Manchester United but when it comes in a title hunt, from a player the casual fan would never have heard of, in a game where United hadn't played well then cue Martin Tyler. Everyone knows this game, everyone knows this goal. I suspect most would expect it to be Martin Tyler's greatest moment, but I think there is one that is even more iconic. Manchester City won the league title in the dying seconds with this goal and football fans were bewildered by what they had just seen, even the maestro himself was shocked. 'Collymore closing innnnnnnnnnnnnnn' - They are the words I will always associate with the voice of the Premier League. Liverpool 4, Newcastle United 3 is still the best game I have ever seen. It had it all and the drama of Liverpool's last gasp winner, Kevin Keegan slumping in the dug out, but most of all Martin Tyler's rabid excitement makes this, in my opinion, Martin Tyler's greatest commentary in his quite remarkable career. Martin Tyler may be the voice of FIFA but another big football game is Football Manager and we have put together our tips for the best Football Manager 2015 Wonderkids.